Glenn Beck has recently been going more insane. He's been losing sponsors over idiotic things he's saying, and the other day he even said there was a shadow government that's really doing everything sinister in America. It seems as though Glenn Beck is getting into that whole "anyone who disagrees with me is a part of it" thing. Naturally with all the talk about shadow governments and secret communist conspiracies in Washington, someone pointed out the similiarities to Alex Jones. Oliver Willis over at mediamatters.org published a story that Glenn Beck is bringing conspiracy theories into the mainstream, and then goes on to talk about how nutty Alex Jones is. Alex Jones responded by having an article about how Glenn Beck isn't like him and is just another government shill. The article then goes on to talk about basically the same things covered in the Obama deception, such as the whole "million man army" thing, then on to how Rahm Emanuel said that they're going to create a massive service forcing everyone to volunteer. Granted the video Alex Jones provides is cut up, no context is given, and it was said in mid-2006, but that doesn't matter. It was basically the same old garbage from Jones which is played out, but what made me laugh most were the comments. They really go to show that these people are smart enough to uncover a massive conspiracy, but are not smart enough to avoid the classic infighting and name calling that destroys movements like theirs. 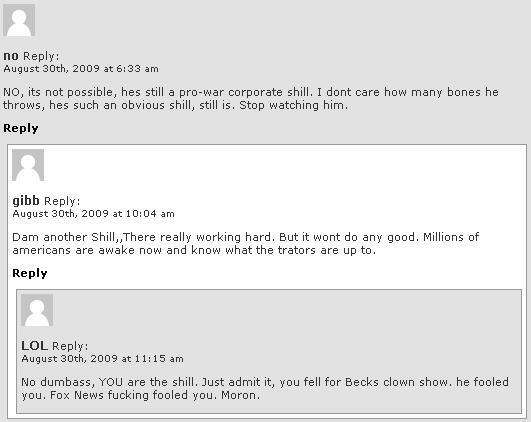 Yes, Glenn Beck listens to 4 hours of garbage every day just to steal what Alex Jones has to say. I guess these guys don't realize that Alex Jones steals nearly everything from everyone else. Even his Behomeian Grove investigation wasn't original, and his analysis originated from that utter moron Texe Marrs. These guys are going to lead the revolution and be the heroes of the American way of life!